Carbofuran (marketed under many trade names, notably Furadan® and Curater®) is a highly toxic insecticide used to control beetles, nematodes and rootworm. It was widely used on alfalfa, rice, turf and grape crops, until being banned by the EPA in 2009. Carbofuran had been detected in trace amounts in streams and groundwater prior to the ban. 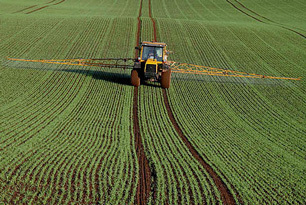 It could still potentially arrive in drinking-water through runoff from banned pesticide use. Carbofuran is highly toxic with acute exposure, inhibiting the enzyme cholinsterase and leading to symptoms of nausea, dizziness, and confusion. Exposure to very large amounts can cause respiratory paralysis and death. Some people who drink water containing carbofuran in excess of the maximum contaminant level [0.04 milligrams per Liter] over many years could experience problems with their blood or nervous or reproductive systems. The EPA recommends granular activated carbon (GAC) for the treatment of carbofuran.